(NOTE attached video is right after-couldn’t get camera out fast enough from backpack) I had my first close UFO encounter in January while out prospecting in the desert west of Nelson, Nevada. When I saw this mercury-like metallic flying humanoid (oblong craft that was vertical). It was completely silent and had not I not been looking in the direction I did I would have missed it. I was only half a mile from it (estimated through Google Earth®) and it landed on the desert floor not too far from me. I would have tried to photograph or video it but was mesmerized by what I saw and I would not been able to get my camera out of my backpack in time at the speed it was moving. Now also I saw a plane and helicopter that afternoon and I heard their engines well and clear even though they were a lot further away. 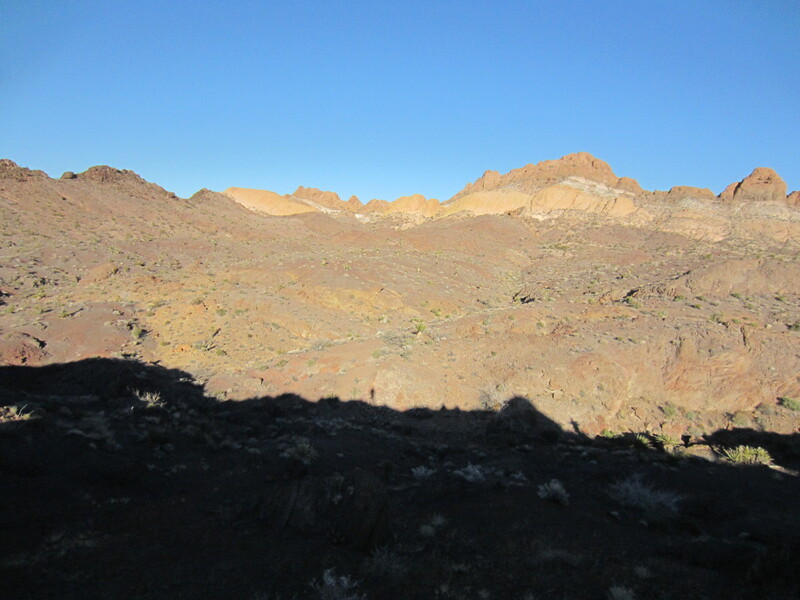 I raced up and down volcanic, rocky ravines to get to the landing area. It was self propelled. It looked like the shape of a person on some kind of flying platform (looked like the T1000 terminator when it was morphing and all metallic and highly reflective like mercury). I could not make out details because it was highly reflective and reflected the sunlight-though it was a simple oblong shape. I could not find it when I reached what I believed to be a landing zone. There was little wind that afternoon. It was not a r.c. type quadcopter (I fly those) -the high vertical proportion would have made it unstable to fly. I was pretty spooked and out of breath by the time I got to the landing zone area. It takes a lot to get me spooked. This is the first time I have spoken publicly about it. I was able to video the part of me hiking like mad to the area (with me out-of-breath) and swearing. It had flown through a gap in the small mountains to the North of me and landed on the ground South of the mountains. I don’t care what people think of me I already pursue spirit phenomena! I also heard gun shots around that time though it is my assumption that it was people target shooting in the desert as they do. I did also notice an tall, thin, old couple (I did not see faces though my impression was they were old) as I was hiking back to my car (at the end of the day) who did not see me hiking back toward them. They strangely were peering into my car windows. They then drove away in a SUV like a Jeep or something heading back toward Nelson as the sun started to set. I was pretty freaked out by what I had seen earlier. I stopped off at the Railroad Pass Casino some 25 miles away to try calm myself down. I am disappointed that I was unable to have my camera out but this I was not expecting and it was only in my visual range for about 10 seconds. It’s a personal experience and I wish that I could have captured or at least have someone else with me at the time. What was a bit odd was this old couple that wore same neck covered hats that were looking at the interior of my Mitsubushi Montero Sport. Makes me think of the movie “Cocoon” with Steve Guttenberg back in 1985 where aliens were living amongst the humans and had a human outer appearance. Did they have anything to do with this craft/being? I don’t know though it made me wonder. Recommended video ghost box (Return to Nelson) responses in the ufo area: Click here to go to Nelson Ghostbox video.